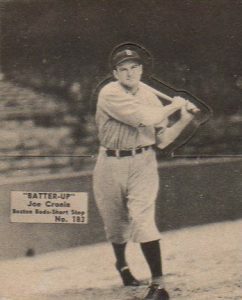 Joe Cronin's unique baseball career saw him become an All-Star shortstop for the Boston Red Sox, then manager and general manager for the team, before finally being elected as President of the American League. Starting with his earliest cardboard in the 1930s, look back at some of the best Joe Cronin baseball cards out there. 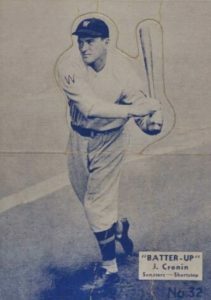 Cronin began his career with the Pittsburgh Pirates, but it was with the Washington Senators that he developed into one of the best hitting and defensive shortstops in the game. Cronin took home the 1930 American League MVP, batting .346 with 126 RBI for Washington. Starting in 1933, Cronin served as player/manager for the Senators and he became one of the few people to ever be traded to fill the manager position when he was dealt to the Red Sox in 1935. As skipper, he would play/manage both the Senators (1933) and the Red Sox (1946) to the World Series, but neither team prevailed. 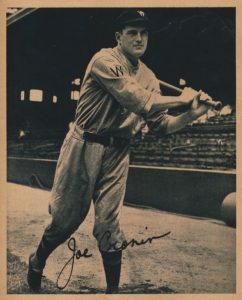 Shop for Joe Cronin Baseball Cards on eBay. 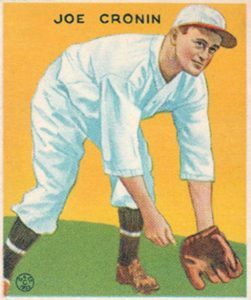 As far as Joe Cronin cards of note that aren't covered below, 1961 Golden Press Hall of Fame was a collection of 33 cards issued in a booklet. The cards, including Cronin, could be separated out and sets that are still intact today command much higher prices. Cronin was also featured in the 1967 Topps Venezuelan Retirado set. The aquamarine background color is very memorable but the card quality is much lower than the standard American releases. Although no Joe Cronin autographs or relics made the list, collectors interested in those cards can look to 2001 SP Legendary Cuts, 2003 Topps Tribute, and 2017 Panini Diamond Kings for bat pieces and cut signatures. In 2016 Panini Pantheon, collectors can pull a multi-player bat relic with Cronin, Ted Williams and Jimmie Foxx. 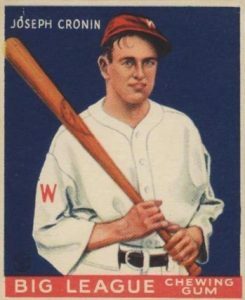 For collectors looking to build a Hall of Fame collection from the 1930s and 1940s, Joe Cronin cards might be a great place to start given the more budget-friendly prices. In putting together this list, value was the primary focus along with an emphasis on cards from Cronin's playing days. Click on the listings or images to shop for specific cards on eBay. Linked sets in the descriptions go directly to detailed profiles. 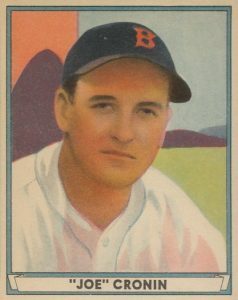 After managing the Red Sox from 1935 to 1947, Cronin became the team's General Manager and served through the 1959 season. 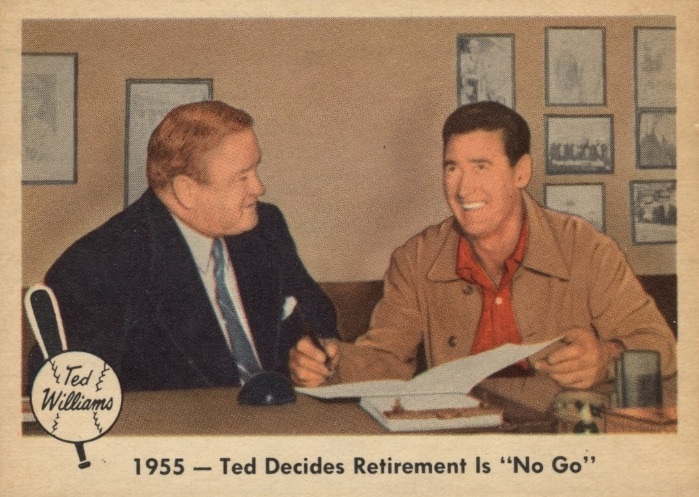 In his capacity as GM, Cronin was included in 1959 Fleer Ted Williams on a card showing Williams un-retiring after initially calling it quits at the end of the 1954 season. "Teddy Ballgame" would miss the first month of the 1955 season before joining the team again. An image of the new contract signing is featured on the Cronin "No Go" card. While U.S. Caramel is an important release that features many key players, like Babe Ruth and Ty Cobb, it is a bit too rare to appear near the top of the list. 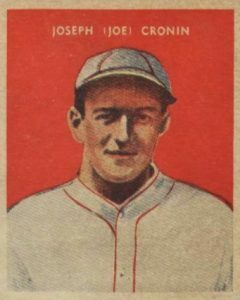 Cronin is included as one of the baseball players in the 32-card set and, at the time, Cronin was player/manager for the Washington Senators. The reverse side of the card notes he was the youngest manager in the league. There is also an advertisement that provides instructions on how to exchange a complete set of cards for a baseball from the candy company. These 1934 photo cards were available to buyers of Butterfinger candy bars with 65 different cards produced in the set. Featured during his time with the Senators, the cards are very basic with blank backs and only a facsimile autograph on the front. Butterfinger cards have become notoriously brittle in the many years since their creation and it is common to find examples with large chunks taken out of the framed border. 1940 Play Ball took the sepia-toned photos found in the 1939 set and added a nice wood frame around the border. The portion of the checklist where Cronin is found—cards #121 to #180—have become known as the "Superman Backs" because they feature advertising for the DC Comics Superman set. That DC set is considered the ultimate Superman release with its original and beautiful art, and the ads bump up the value of the Play Ball cards slightly. If you are able to get your hands on a 1936 National Chicle Fine Pen card, you might have a hard time identifying it. Collectors use the thin ink facsimile signatures, which have been dubbed "fine pen," to differentiate it from the many sets of the day. 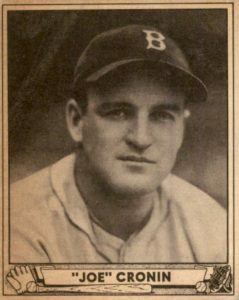 Cronin's card is one of the first featuring him with the Boston Red Sox after being traded to the team before the 1935 season. 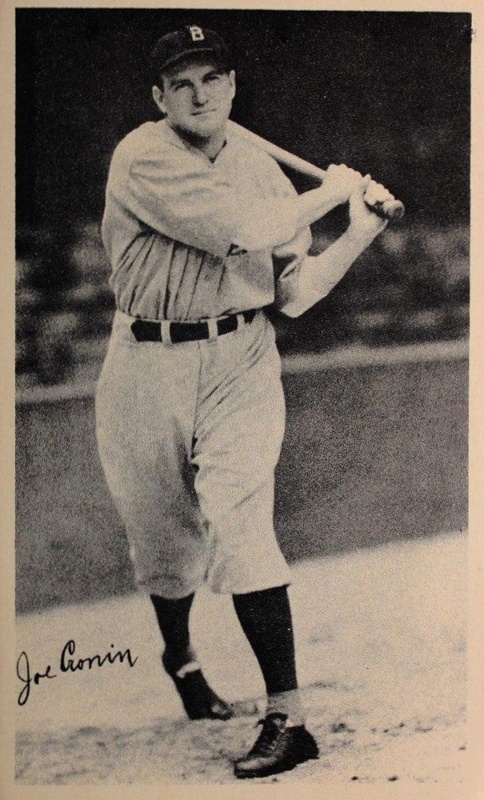 The Joe Cronin cards in 1934-1936 National Chicle Batter-Up are a great example of how the multi-year set was able to update player changes over the years. 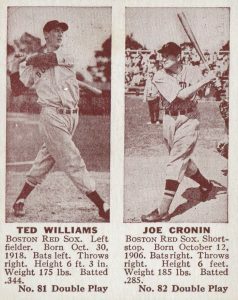 The first Joe Cronin card (the blue version on the left) shows him with the Washington Senators, while his second option near the end of the checklist has him swinging the bat as the Boston Red Sox shortstop. While all Batter-Up cards are highly valuable, the high-number cards (including Cronin's second appearance) are worth significantly more than the lower numbers. 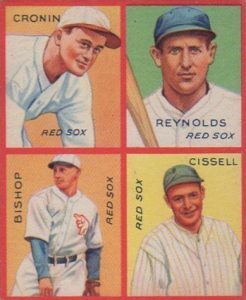 Cronin is positioned in the top-left of his four-panel 1935 Goudey 4-in-1 card that he shares with his Boston Red Sox teammates. Joining Cronin is outfielder Carl Reynolds, infielder Chalmer Cissell, and second baseman Max Bishop. The reverse side of each '35 Goudey card is one puzzle piece from a bigger image. Cronin himself is one of the larger puzzles that could be put together by collecting the set. Like many stars featured in 1941 Play Ball, this Joe Cronin card is a colorized version of his 1940 Play Ball release. However, it is the colorization that makes all the difference with collectors. Cronin is also positioned in an odd setting, where a wall, green open field, and mountain are all visible in the background as he faces the sun. 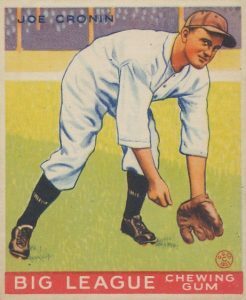 The card back highlights Cronin's impressive defensive skills as he led American League shortstops in putouts and double plays from 1930 to 1932. 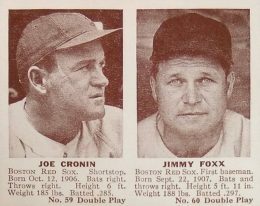 Cronin is paired with two all-time greats in 1941 Double Play, sharing space with both Jimmie Foxx and Ted Williams. Foxx was reaching the end of his career, playing one final season in 1942 before retiring. In contrast, Williams was at the pinnacle of his career. He hit .406 in 1941 shortly before losing three seasons due to service in World War II. While Cronin wasn't quite to the caliber of Williams (who was, really? ), Cronin still had some impressive numbers, including eight seasons batting above .300, and knocking in 100 or more runs eight times, as well. A testament to how popular he was at the time, three separate Joe Cronin rookie cards come in 1933 Goudey. As is usually the case for players with multiple cards in the '33 set, it is the first appearance (the blue card) that holds the most importance and value with collectors. Cronin's other two cards both have the same basic image. However, card #109 with the yellow background has the "Big League Chewing Gum" banner removed from the bottom of the card. Another slight difference is that card #109 shows Cronin looking in the direction of the ball, while card #189, featuring a grass field and stadium background, seems to have Cronin staring directly at the viewer.